next post: Australian government doesn’t deserve office, nor does the Opposition! Today I am in Granada, Spain having an interesting time. Nothing public to report. I will be here until Thursday morning upon which I travel back to Madrid and the public events begin (see below). Today’s blog continues the analysis I have been providing which aims to advance our understanding of why the British government called in the IMF in 1976 and why it fell prey to a growing neo-liberal consensus, largely orchestrated by the Americans. The current book I am finalising with my Italian colleague Thomas Fazi, is tracing the way in which the Right exploited the capacities of the ‘state’ to advance their agenda and how they duped the Left into believing that globalisation had rendered the nation state powerless. There were several turning points in this evolution, and one of those key moments in history, was the assertion by British Labour Prime Minster James Callaghan on September 28, 1976 that Britain had to end its ‘Keynesian’ inclinations and pursue widespread market deregulation and fiscal austerity has been taken to reflect a situation where the British government had no other alternative. His words have echoed down through the years and constituted one of the major turning points in ‘Left’ history. Successive, so-called progressive governments and politicians have repeated the words in one way or another. The impact has been that they have forgotten that their were options at the time that the British government rejected, which would have significantly altered the course of history. Today, we consider the role way in which the IMF reinvented itself after its raison d’être was terminated with the collapse of the Bretton Woods fixed exchange rate system. The next part of the story will examine the growing US influence on the IMF and the way it used the IMF to further its ‘free market’ agenda on a global scale. The story of Britain in 1976 is not just about the so-called ‘British disease’ – the demise of its industry and the bias toward inflation – and the failure of governments to deal with it. It is also a story of the way the US government, intent on promoting free market ideas around the world, pushed through a shift in thinking in the International Monetary Fund and turned it into one of the premier neo-liberal attack dogs. As I concluded in my last instalment, the Powell Manifesto was very influential in concentrating the efforts of capital on restoring profit rates as the profit squeeze in the late 1960s and early 1970s gave it genuine concern that its hegemony at the apex of the economic system was being challenged. Please read my blog – The right-wing counter attack – 1971 – for more discussion on this point. The US was turning to the right and further emphasising its ‘free market’ predilections, which should not be taken to mean it was running a textbook-style competitive market economy despite the constant appeal by the elites to that stylised model of ‘efficiency’. While the representative of capital, which included a plethora of media interests, a growing number of academic economists, the burgeoning and well-funded think tanks, and the co-opted politicians and the lobbyists who had bought them off, typically presented their pleas in terms of the need to increase efficiency to restore competitiveness (a straightforward appeal to the authority of the mainstream microeconomics textbooks), the agenda was quite different. The reality was that what they wanted was for the state to use its powers to tilt the economy (its distributional processes) more heavily towards the corporate sector and the financial market sector (‘Wall Street’), in particular. While the Left was conned into believing that the policy options were becoming limited in the face of an increasingly globalised world, the Right were much smarter and new they had to compromise the state and advance its agenda through the capacities they knew were the monopoly of the state – currency-issuance, legislative fiat, and the power to set the regulatory environment. How the Left was led down the path of ignorance is a testament to both the ingenuity of the Right and the machinery it set up to regain control of the policy agenda and the increasing splintering of the Left into peripheral ‘post modern’ deconstructions. Somehow, class struggle was no longer central to a lot of Leftist thinking and, in its place was a massive investment of time and energy into gender, race and sexuality type issues. But in leaving the main game to the Right, the Left helped to reinforce the neo-liberal hegemony and the myths (dishonesty) that created it and upon which it still rests. As part of this evolution, the US government became the international political conduit for ‘Wall Street’ influence and the growing influence of the ‘City’ in London, also allowed these neo-liberal ideas to permeate the policy making circles in Britain and, specifically, the upper echelons of the British Labour Party. But it wasn’t just a permeation that was going on. The US used institutions such as the IMF to conduct brute force attacks on the prosperity of nations to undermine the viability of their public sectors and to shift more of the national income and national assets into the hands of capital. It was a brazen and very determined shift in world affairs. The IMF was initially conceived at the UN Monetary and Financial Conference at Bretton Woods, New Hampshire in 1944 as one of the two major international institutions (along with the World Bank) to rebuild the damaged economies after the Second World War and to ensure (in the case of the IMF) that there would be no return to the Great Depression. The IMF was empowered to be an unconditional lender to nation’s in trouble to ensure there would not be another collapse. It quickly morphed into becoming a major provider of foreign currency to nations running chronic current account deficits which ensured the fixed exchange rate system was sustained. Its so-called ‘free market’ credentials now, were not in evidence then. It actively sought to maintain the market distortion that was imposed by the Bretton Woods system of currency convertibility. All currencies were valued against the US dollar and the IMF loans subsidised these parities in the face of shifting trade balances. In the spirit of the day, many of the original IMF staff “were initially drawn from the national delegations to Bretton Woods” (Chwieroth, 2007: 15), and reflected the consensus that the time that nations should have the “freedom to pursue expansionary macroeconomic policies without endangering exchange rate commitments, and the desirability of capital controls”. The IMF was conceived essentially as a Keynesian institution. This linkage should not be surprising, since Keynes was one of its founding fathers and the other (White) was a New Deal economist who had championed the use of countercyclical monetary and fiscal policy as early as 1932. (see also League of Nations, 1944). In the early days, the IMF role was somewhat muted as their was relative international currency stability in the initial phases of Post World War II growth. The main controversy was the differential way that the IMF treated advanced countries that required reserves and the way it treated the poorer nations. The latter were subjected to more severe ‘conditionality’ on the loans, which ultimately led to such resentment that by the late 1960s, the IMF revised its practice with respect to the advanced nations. Britain’s call on the IMF credit line in 1976 was not the first time it had done this. However, as we will argue, it was the first time they sought IMF credit after its currency sovereignty was restored with the collapse of the convertible, fixed exchange rate system and the unconditional float of the Britain pound. Previously, under the Bretton Woods system, Britain had drawn on the IMF support in 1961, 1964 and again in 1966. Ultimately, the British conceded that the pound was overvalued in relation to their trade fundamentals, and in 1967, the pound was significantly devalued. But under the system of convertible currencies and the responsibility of the Bank of England for maintaining the agreed parities against the US dollar (and therefore all other currencies in the Bretton Woods system), the calls on the IMF for funding were required to prevent the Bank of England from running out of foreign currency reserves as it defending downward pressures on the pound arising from persistent current account deficits in the 1960s. By 1976, the Bank of England was no longer responsible for maintaining any particular parity. The common link between the behaviour of the British government and the Bank of England across these two radically different monetary systems (the convertible, fixed exchange rate system on the one hand and the fiat, floating currency system on the other) was the false pride that the British attached to the level (or parity) that the pound assumed against other currencies. It was considered an indicator of the ‘greatness’ of Britain for the pound to retain a ‘strong’ value, say, against the US dollar. The upshot was that it was hopelessly overvalued during the 1960s and again in the mid-1970s. The other factor that was relevant in 1976 was the persistently high inflation that Britain was enduring. We will come back to that in due course. The American influence on the IMF was a constant issue throughout its history, particularly with the French, who suspected the Fund of acting as an agent for American imperialism. An understanding of the evolution of the Eurozone requires one to understand this French antagonism towards the Americans (see Mitchell, 2015). The discussions about monetary integration were clearly conditioned by the historical Franco-German rivalry. France was determined to create institutional structures that would stop Germany from ever invading it again. It saw an integrated Europe as a way of consolidating a dominant role in European affairs but was determined to cede as little national sovereignty as possible to achieve these aims. But France was also resentful of the influence that the US was exerting in Europe, particularly through the Marshall Plan, which intrinsically tied West Germany to the US. It also saw the growing presence of US companies in Europe as part of this creeping American influence. [Reference: Mitchell, W.F. (2015) Eurozone Dystopia: Groupthink and Denial on a Grand Scale, Cheltenham, Edward Elgar]. The French antagonism towards the IMF also reflected the dominant role that the US played in the funding of the institution, its location in Washington, and the major role of the US dollar in the international financial system. It was abundantly clear that the US government saw the IMF as a vehicle to extend the reach of American capitalism (Stiglitz, 2002). The World Bank still had a role to play in providing support to poor nations that either needed developmental assistance or who couldn’t fund essential imports. The IMF had outlived its purpose. But institutional inertia prevailed. The IMF soon reinvented itself once it became clear that exchange rates were not going to return to the previous fixed regime on any global scale. The Europeans clearly maintained various forms of the fixed exchange rate system, mainly because the Common Agricultural Policy would have become unworkable with floating rates across the Member States of the European Union and the agricultural lobby was powerful in its defense of the CAP. But, in general, exchange rates began to float. The IMF also came under increasing US influence as it was redefining and justifying its continuing existence, suggesting that the French fears in the 1960s were not as ill-founded as some might have thought at the time. In the next instalment we will trace this growing US influence on the IMF as the latter made its transition into one of the neo-liberal front line institutions that capital commandeered to restore its hegemony in the 1970s. We will examine the so-called “Wall Street-Treasury complex” and how it spread its tentacles and how the Left confused this new pervasive ideological shift for globalisation and surrendered. I consider this discussion is essential for understanding why Britain called in the IMF in 1976. 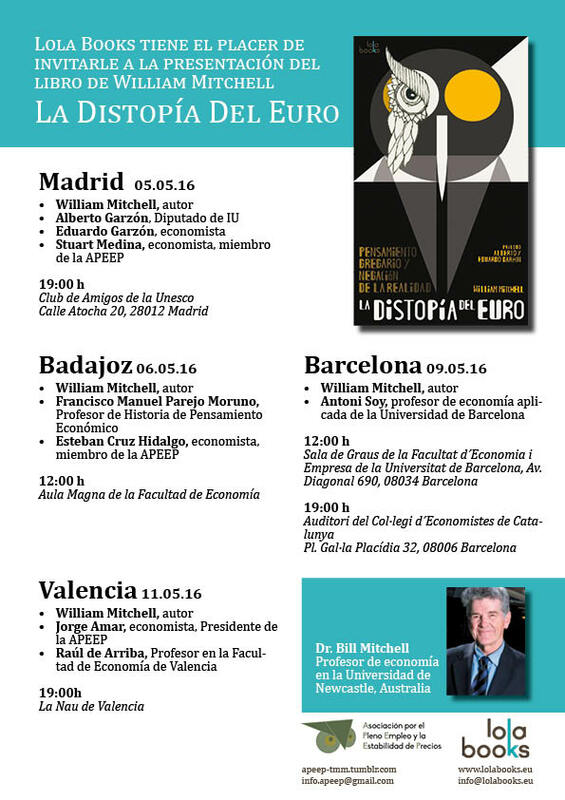 Here are the details of my Spanish speaking tour which will coincide with the release of the Spanish translation of my my current book – Eurozone Dystopia: Groupthink and Denial on a Grand Scale (published in English May 2015). Enjoy the old Moorish city and Alhambra,if you get the chance! Is it ironic that the current head and previous one of the IMF are French? is this a US sop to Europe? From the paragraph below, who do you mean by external deficit nations? Also, do you mean that government spending was directed towards defending the currency instead of domestic spending, which caused high unemployment and low economic growth? The Basilica in Granada is truly overwhelming, and very rich. Very much worth a visit. A truly surprising interior, even after seeing the linked photos. The sentence the “French suspected that the IMF was an instrument of US imperialism” is one that makes you amused and angry at the same time. Looking at what has happened to so many third world countries who have been crippled with loans that were not used for the people, but those populations have been burdened with the imposed debt and austerity, younwould think that by now everyone would have this down as a certainty, not a suspicion.